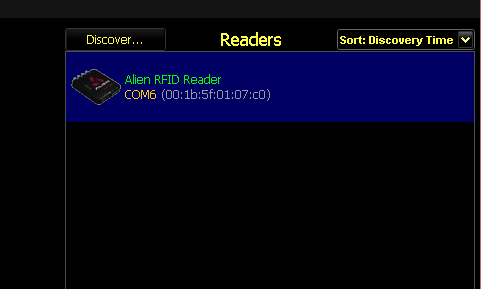 This article provides a step-by-step process for setting up the ALR-F800 reader from Alien Technology. After unboxing your reader, connect an antenna to the first antenna port, labeled ANT0. Once this is done, power up the reader either via DC power supply or through PoE. On startup, the reader will cycle through the LEDs on the top of the reader and then the LED for Power will become solid green. The F800 reader supports communication protocols via serial and network connections. The process for using both of these methods is outlined below. Connect the reader to a PC by inserting the provided serial cable into the reader's USB Console port. Once the cable is plugged into the PC, the PC should assign the reader a COM port. To find this COM port, open Device Manager and select Ports (COM & LPT) and find the COM port listed there for the reader. In the image below, the reader was assigned COM6 as a "USB Serial Port" device. Next, launch the Alien Gateway software and select File > Preferences from the top left of the menu. In the Preferences menu, navigate to the Discovery tab and select the options for "Enable Serial Discovery" and "Scan only these ports (case-sensitive):". In the text box below the latter option, enter in the name of the selected COM port earlier. Alternatively, select the "Scan all detected ports:" option to have the Gateway software scan all available COM ports for the connected reader. Once this is done, select "Close" to go back to the main menu screen where your reader should be listed in the top right-hand corner of the screen. If the reader is not listed, close the program and re-launch it in order for any changes to take affect. Once the reader is listed, a simple tag inventory can be performed. To connect to a reader via a local network connection, connect the reader to your network using an ethernet cable. 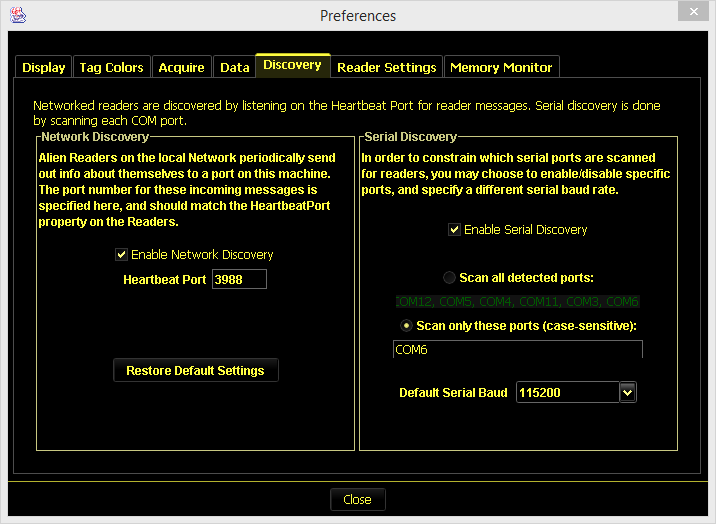 In the Alien Gateway software, select the "Discover" button and select the option "Look for a reader connected to the Local Area Network (LAN)". Any connected readers should automatically be recognized by the Gateway software and added to the Readers list. If they are not added automatically, you have the option of manually entering in the reader's IP address. You may also need to set your computer's IP address to the same subnet as the reader (192.168.1.99 would be a good starting place). To find the reader's IP address, connect it via the serial connection by following the steps outlined above and enter the "info" command into the Gateway Software's "Command Line Interface". 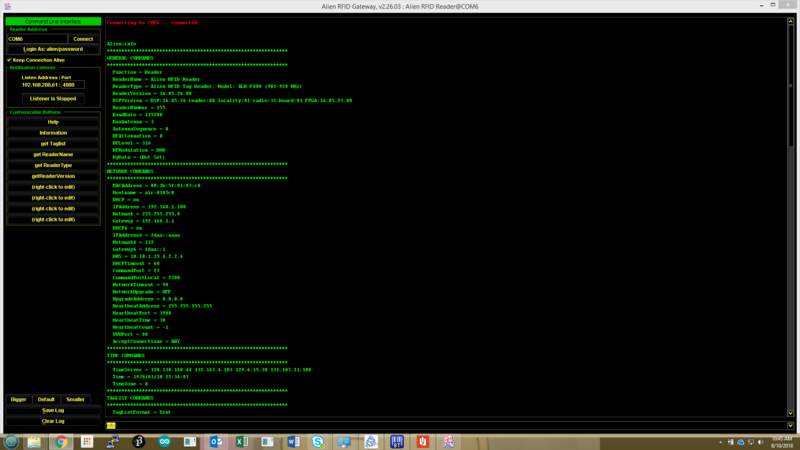 This will provide the user with the reader's information, including it's current IP address. To perform a simple tag inventory operation, select the Tag Grid menu option to open the Tag Grid application. This application will show all tags currently being read by the reader and constantly update the screen with the responding tags. 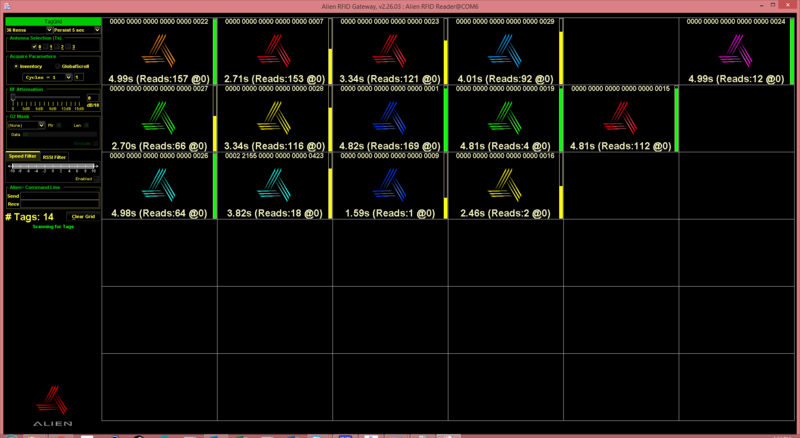 Each grid square represents a single tag and contains information about each tag. Each tag's EPC can be seen at the top of each grid square, and additional information (such as the time elapsed since the tag's last response) can be seen at the bottom of each grid square. Additional settings for reading tags can be found under the File > Preferences menu.